After enjoying part 1 of the Free Sydney list, bring on more fun in Sydney with these free events and activities in September. Missing the lights of Vivid? 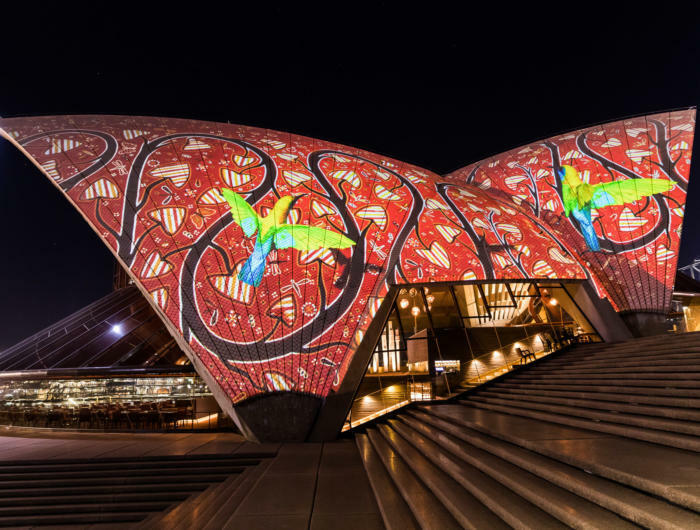 Enjoy a daily dose of art as the sun sets over the Opera House, with the story of Australia's ancient First Nations portrayed in a spectacular 7-minute light projection. Badu Gili, meaning water light in the language of the Gadigal People, begins at sunset, best enjoyed from atop the Monumental Steps of our Sydney Opera House. Visit the Sydney Opera House website for details. Want to try a martial art without duelling with Jackie Chan? Avoid the black eyes and broken bones with Tai Chi, the gentlest form of martial arts, using flowing movements to improve balance, posture, flexibility, core stability and muscle strength. Originating from ancient Chinese philosophy, this safe exercise encourages mindfulness as you connect with nature, promoting a healthy mind and body. Feel the serenity at 19 Greenknowe Ave, Elizabeth Bay. Call 0425 362 121 for details. Exercise doesn't need to involve torturous treadmill and weight-lifting sessions. Improve your fitness in one of Sydney's finest parks, Centennial Park, with a team of expert conservation volunteers as you learn the practical steps to maintain the varieties of native and exotic plants. Visit the Green Gym website for details. As spring gardens glow with colourful blossoms, the Galeries at 500 George St serve spring-inspired fusions of foodie treats, served while live music and art is on display. Try fruity flavours of edible balloons, popcorn from the Kettle, Australian tea, and organic ice-cream. Special tote bags are for sale, with prizes for selfies posted on Twitter. Visit the Galeries website for details. While Van Gogh's sunflowers are a masterpiece, many priceless artworks portray the beauty of the human body. Practise your drawing skills in a 3-hour session as 3 models pose to inspire your inner-artist. Grab a pencil, charcoal or paintbrush and enter the life drawing competition at the Canvas Bar on 364 Kent St, Sydney.Visit the Canvas Bar website for details. During the Fringe Festival, Kensington St in Chippendale will be lit up with live entertainment, food stalls and a lively atmosphere as it becomes the official village for the festival and the best place to mingle with the artists and experience the edgy fringe of Sydney's culture and arts. Visit the Fringe Festival website for details. Become the next Australian Open Juniors champion as you serve an ace with tips from the City Community Tennis Centre coaches before enjoying a sizzling barbecue at Alexandria Park on Buckland St. Visit the City of Sydney Youth Workers website for details. Nature's colours bloom in spring with over 1,000 hanging baskets, floral towers and planter boxes sprouting across Sydney streets, from Martin Place and Customs House to the QVB, Town Hall, Hyde Park and Greens Square. Don't miss the green wall at Kings Cross. Visit the City of Sydney website for details. on 280 Pitt Street, Sydney.Visit the Sydney Mechanics School of Arts website for details. Under 5s will love the interactive artwork inside the Room of Lucky Charms, an exhibition with games, books and colourful creations in the Museum of Contemporary Art. Visit the MCA website for details. Tokyo is home to some of the quirkiest and unique pop culture trends, including the vibrant street fashion captured in FRUiTS magazine for over 20 years. Stroll through the wardrobes of experimental fashion, blending a series of Japanese and Western influences which defined the bold, fun identity of Japanese youth. The exhibition is hosted at The Japan Foundation, Level 4, Central Park, 28 Broadway, Chippendale. Visit the Japan Foundation website for details. At the Soda Factory on 16 Wentworth Avenue, Surry Hills, settle in with free popcorn, $5 snacks and $5 drinks until 7pm to see a classic film each Monday. The program continues on September 18 with Charlie's Angels, followed Muriel's Wedding on September 25. Visit the Soda Factory website for details. Feel the fiery passion of Latin beats or chill with the silky sound from smooth and stylish jazz artists taking the mic at the World Bar, Potts Point. Enjoy the show or step up and live your musical dream. Visit the World Bar website for details. Break a sweat with the coolest cardio in town at the Harry Jensen Centre, 17 Argyle St, Millers Point. Zumba is the 21st century phenomenon in fitness, an aerobic all-body-workout with dynamic choreographed dance. Each class will boost your balance, stamina, coordination, flexibility and strength. Phone 02 9244 3696 for details. Looking for more free fun in Sydney? Check out part 1 here. Is there another free activity or event you're looking forward to in September? Please let us know with a comment.